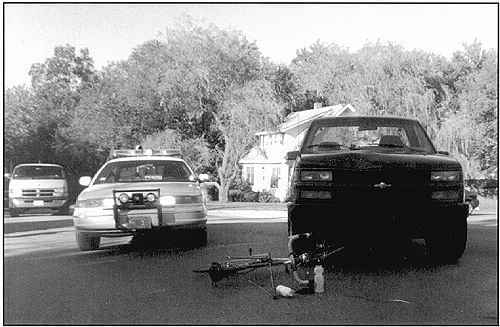 When the facts of a bicycle crash are unknown or are in dispute, careful reconstruction work often can reveal what actually happened. As this page loads, a black and white photo will cover up the color photo, below. Pass your mouse cursor over the black and white photo to compare it with the color photo. A police photographer took the black and white photo. It shows the front of an SUV where it came to a stop following a collision with the bicyclist, Diane Daniel. That collision left the dent which is visible in the front of the SUV's hood. I took the color photo during an investigation at the crash scene. By duplicating the alignment of trees and posts in the background of the police photo, I was able to find where the police photographer stood and to take my photo from within a few inches of the same spot. I had an assistant -- Ms. Daniel -- (in the white car) duplicate the maneuver the SUV made, and stop where the SUV stopped. The SUV made a left turn from the street at the right rear in the photo below. The chalk markings on the pavement in the photo identify the locations of the photographer and the front of the SUV. Notice that the side of the car lines up with the front of the house in the background. 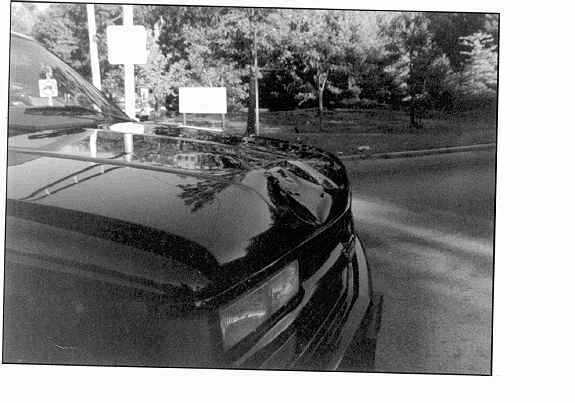 Comparison with another police photo (below) establishes that the SUV came to rest at very nearly the same angle in the street as Diane's car. Notice that the SUV's front wheels are still turned to the left. I took measurements of the intersection and constructed a map, below. The black cross indicates the police photographer's location. Notice that the final position of the front of the SUV was more than 12 feet outside the boundaries of the intersection. As the map shows, the SUV turned left abruptly. The dashed arrows show the paths of the bicycle and SUV before they collided. The path of the SUV can be reconstructed accurately, since its starting and final positions and angles are known. The path of the bicycle can be reconstructed from physical evidence and from the report of an eyewitness. Impacts to the bicycle and rider were from the left side. 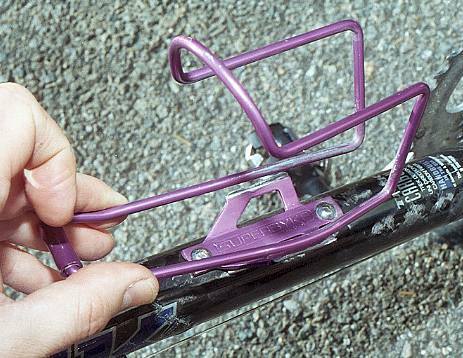 The water bottle cage in the photo below was torn from its mounting plate when it was struck from its left. Also note the damage to the left side of the bicycle's down tube just below my thumb in the photograph. The police report described marks extending from the right front to the left middle of the SUV's hood. The eyewitness was another bicyclist who had overtaken Ms. Daniel shortly before the accident occurred, and who remembers that the SUV was waiting to turn as he crossed the intersection. Both bicyclists entered the intersection from the west, and the SUV entered from the east. The first bicyclist entered the intersection just after the light turned green, and so everyone had a green light, and the SUV started from a stop. The SUV's driver stated that the bicyclist wandered across to the left side of the roadway and struck his SUV head-on. This statement is not supported by any other evidence. If this had actually occurred, the damage would have been to the front of the bicycle, the bicyclist would have slid straight back along the hood or to its right, and the SUV almost certainly would have stopped well short of where it did. A police investigator produced the diagram below. (I have turned it upside down, to place north at the top so it agrees with my map.) Pass the mouse cursor over the police diagram to compare it with my map. The police diagram reflects the reporting officer's correct judgment -- probably based on the marks on the hood of the SUV, and in disagreement with the driver's statement -- that the SUV driver turned left into Ms. Daniel's path. However, the police diagram is not based on a complete set of measurements. It does not accurately map the intersection, and it does not show the final position of the SUV, although this could have been determined from direct measurement. From the police photographs, police report, injury reports and damage to the bicycle, I was able to establish that the SUV traveled completely across and past the bicyclist's lane of travel, striking her while in that lane. 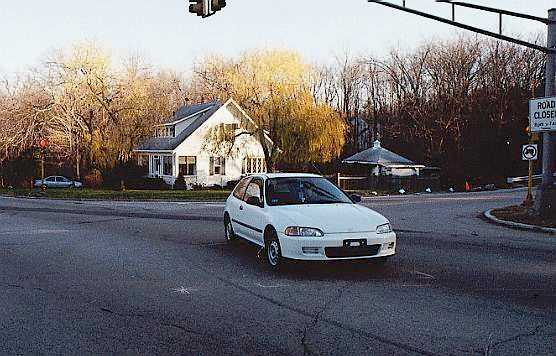 From the final position of the SUV, it is clear that the collision could not possibly have occurred near the center of the intersection, as shown in the police diagram. The SUV was never there. The driver's unusually abrupt left turn suggests that he was trying to cut in front of the bicyclist, but underestimated her speed. Ms. Daniel has, fortunately, largely recovered from her injuries, but -- despite wearing a helmet -- she was knocked unconscious in the crash and does not remember it. The witness who had just overtaken her heard the crash behind him and went back to help, but he did not see the collision occur. There were no other witnesses, and so there was nobody who could dispute the SUV driver's statement until the facts became clear as a result of the investigation. The investigation made it possible to present a strong claim based on the driver's failure to yield right of way to through traffic. When the results of the investigation were brought forward, the SUV driver's insurance company was willing to settle the case.